In the realm of long-lived trees, Ginkgo is among the oldest. Some Ginkgos in East Asia are more than 4,000 years old. This tree’s method of longevity provides answers for humanity’s alchemical anti-aging quest. Ginkgo biloba's beautiful fan-shaped leaves turn canary-yellow in fall. The leaves turn from tip to stem. Ginkgos’ abundance in antioxidant flavonoids can serve humans when they ingest them, but they are vital to the plant’s developed ability to protect itself from environmental stressors. Flavonoid compounds predominate in the surface of plants serving as an exterior structure, counteracting oxidative stress from pollutants and, more interestingly, acting as communication molecules, much like our own hormones, to warn the plant of threats. Current research suggests plant flavonoid compounds can communicate with human hormone receptor-sites and actually lower cortisol, a primary hormone associated with stress. 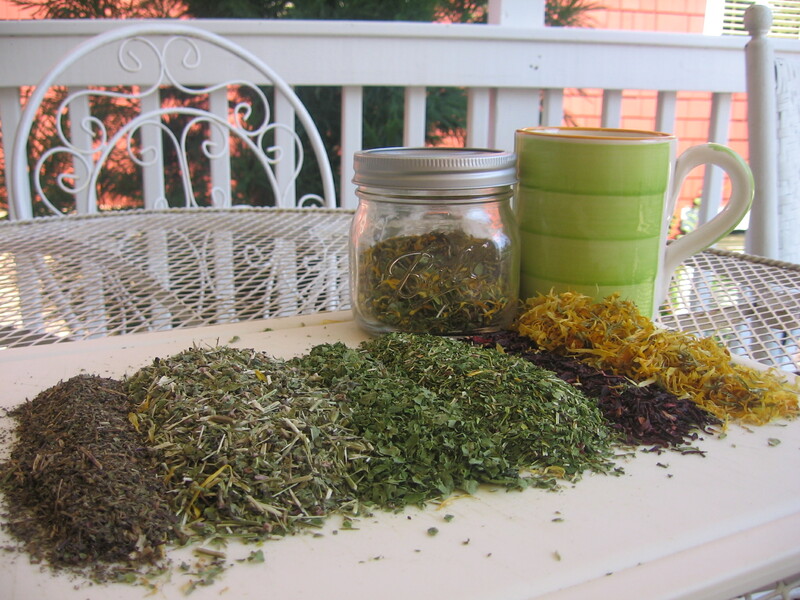 Through multiple mechanisms Ginkgo enhances brain function. Ginkgo has been shown to actually support and enhance the function of neural tissue by protecting neurons from damage, and also regenerating neurons. Ginkgo leaves protect the brain and cardivascular system from oxidative stress, and actually enhances brain function. In a college town, many can identify with the consequences of burning the candle at both ends: forgetfulness, depression, general cerebral insufficiency. Ginkgo is used to restore brain function in generally healthy adults experiencing mental exhaustion or attention deficit. Research shows Ginkgo has prevented beta-amyloid plaques implicated in Alzheimer’s disease, and has enhanced neurogenesis in the hippocampus, a significant memory area of the brain. Ginkgo’s circulatory support enhances the blood flow by preventing damaging oxidation to lipids, or fats, in the arteries and capillaries. Studies show Ginkgo-treated red blood cells become more slippery and flexible, less sticky, which ultimately prevents atherosclerosis. Ginkgo didn’t become internationally known for circulatory and brain support until German physician Dr. Willmar Schwabe studied its effect on circulation, oxidation and brain health. 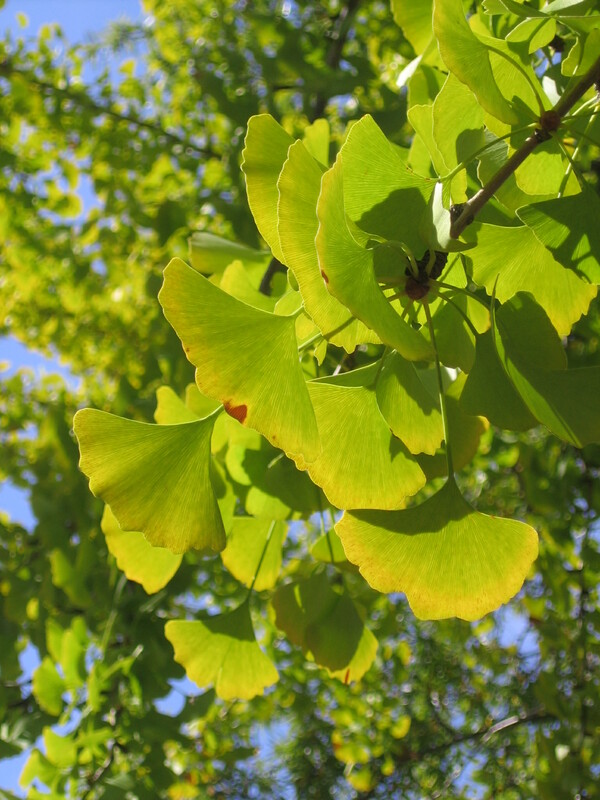 Schwabe’s extract is known as EGB761, and is the reason why Ginkgo is the most studied plant medicine in Europe. Currently, controversial banter exists between one camp claiming the only therapeutic benefits from Ginkgo leaves can be obtained from laboratory-isolated compounds, and standardized extracts of 24 percent ginkgo flavone glycosides and 6 percent erpene lactones. The other camp states harvested young leaves from “wild” trees also are effective in supporting brain and circulatory health. Traditional Chinese medicine utilized the seeds, which are more like nuts, more than the leaves, and each part offers different medicinal properties. The seeds are removed from the stinky flesh of the female fruit, then cooked, and utilized for lung ailments. A Chinese restaurant in the Washington, D.C., area serves Ginkgo seeds as a tasty appetizer. 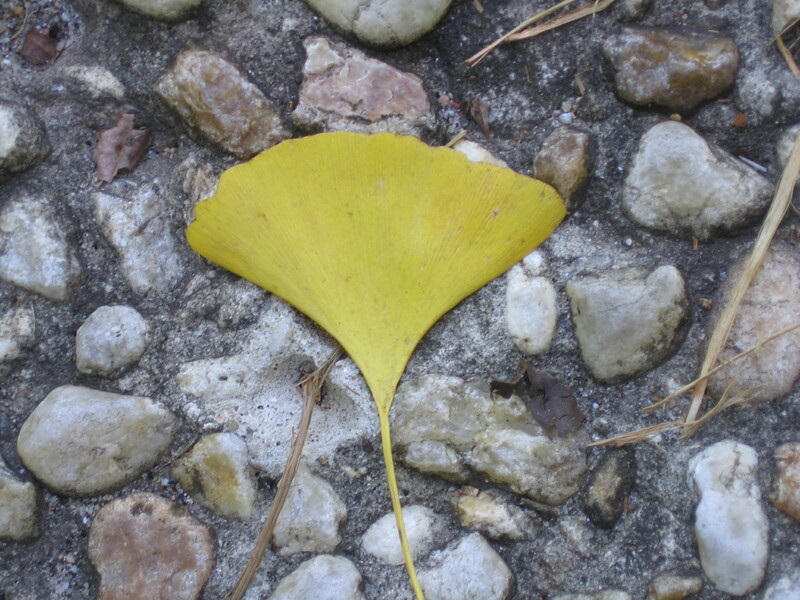 Antioxidants within Ginkgos provide the power to withstand urban pollution, and grant them the approved status of acceptable trees for city streets. If they’re male, that is. Female fruits smell like rotting flesh in order to attract animals to serve as seed distributors. Although this works for the tree, it’s off-putting for the human olfactory senses. Ginkgos offer a gloriously uniform, canary-yellow brilliance in the fall, which flutter down, covering the sidewalks, so that above and below is completely gold. During this mesmerizing phenomenon, it is the best week to be strolling through downtown Athens. This article originally appeared in the Urban Forager Column of Athens Banner-Herald on Sunday, November 7, 2010.